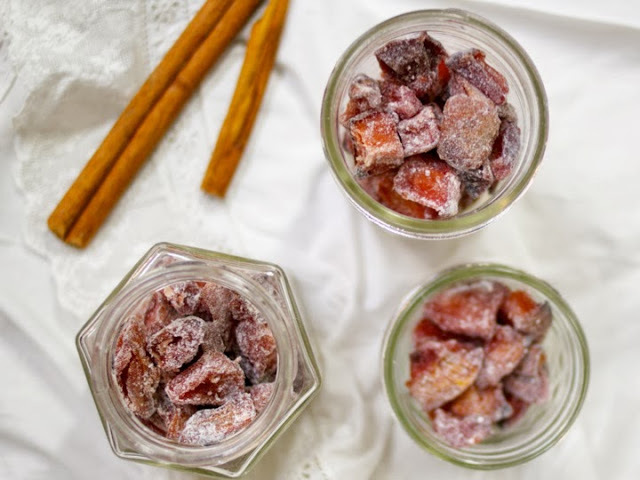 Candied quince are like elven treats that one eats in fairyland, or Turkish Delights from a colorful market bazaar. 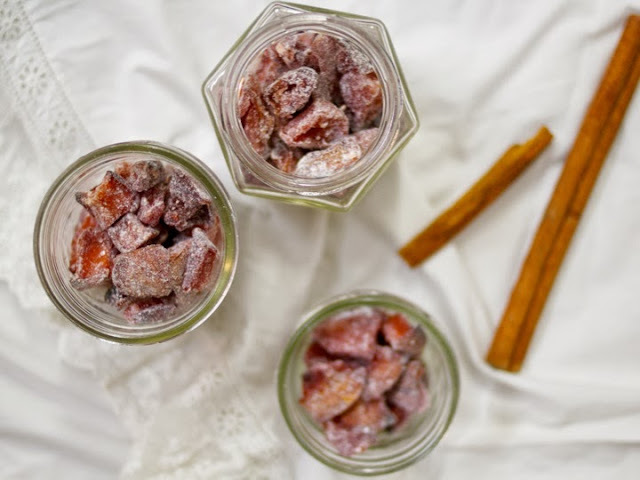 Track down some quince and make some candy to wrap up in jars for your friends and family this holiday season! Bobby and I spent Sunday evening with our dear friends and food-lovers Shanti and Steve. The pair are superstars in the kitchen. Shanti (a wood-fired pizza mastermind and the baker behind Shantilly Picnic) kneads her tender loving care and natural talent into dough. Steve applies his engineering background to perfect the science of every loaf. We spent the evening at Steve’s family’s house in Tarrytown this weekend, baking pizzas up the wazoo in their home-built oven, followed by a medley of Shanti’s sweet creations from her new post as Head Pastry Chef at RiverMarket Bar & Kitchen. My favorite was the candied quince galette, but then again, I’m obsessed with anything Shanti puts in galettes! 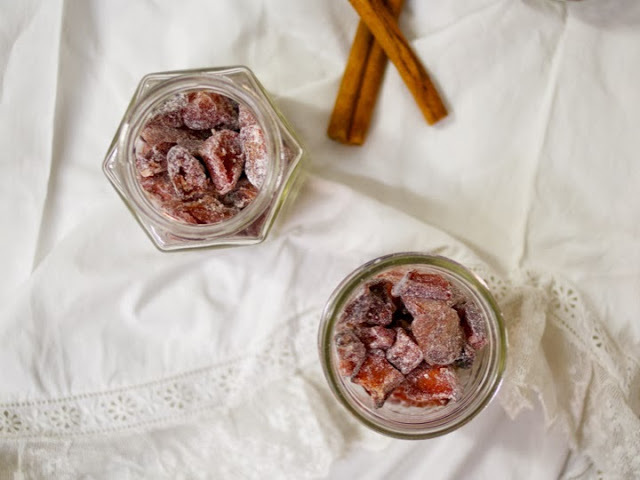 I was intrigued by the candied quince, as I’d only ever added quince to applesauce. It has a high pectin content, which creates that thick, jelly-like consistency in jams and jellies. It also adds a beautifully aromatic flavor and ruby color to any concoction. But candied! Oh my! When I returned to Ithaca I went straight for the batch of quinces feeling sorry in my refrigerator drawer at having been neglected this season along with the applesauce. (Yes, I’m accepting jars in exchange for other canned goods I did manage to make time for, like apricot puree, canned peaches, strawberry jam and more!). Don’t hesitate…this recipe is easy and magical! Scrape the delicious jelly off the bottom of the dish and add it to the blender if making guava paste, or smear it right on a fresh slice of toast with butter. Core the quinces and cut into uniform pieces, no bigger than 1 inch. (Most people peel quinces for a completely soft, even texture, but I didn't and they turned out lovely with slightly crisp edges on a few of them. It was also much faster to prepare them.) 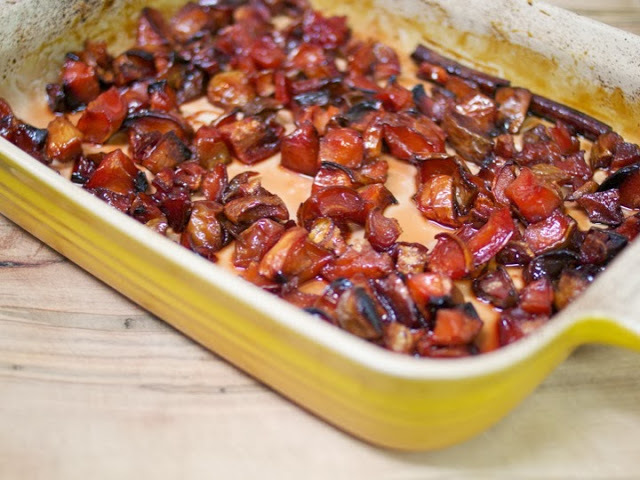 Spread the quince in a baking dish (not the lined baking sheet) in an even layer. 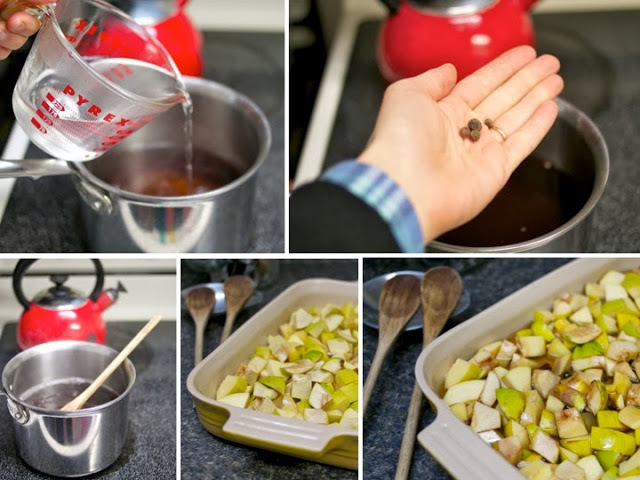 Combine the sugar, maple syrup, cinnamon stick, cloves, and allspice in a medium pot and bring to a boil, stirring to dissolve the sugar. Pour the liquid over the quinces and put the baking dish in the oven. Bake for about 3 hours, stirring the quinces after 30 minutes to make sure they are evenly coated in syrup, and then again every 45 minutes to make sure they do not burn. The quinces will be done when they turn a gorgeous ruby red, and the syrup has completely evaporated. 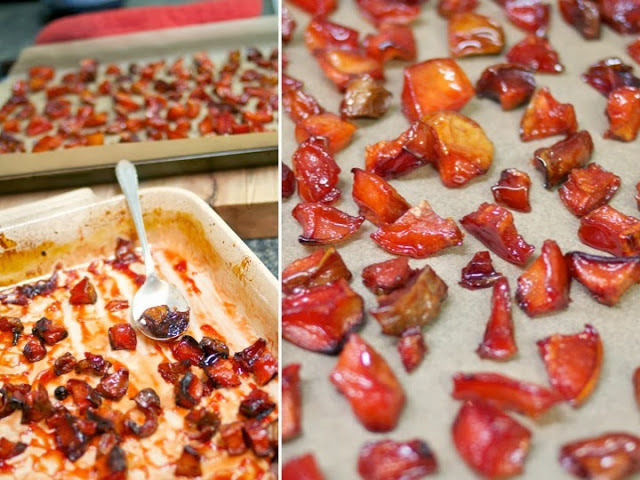 Remove the dish from the oven and transfer the quince pieces to the parchment paper to cool. Now you have choices. 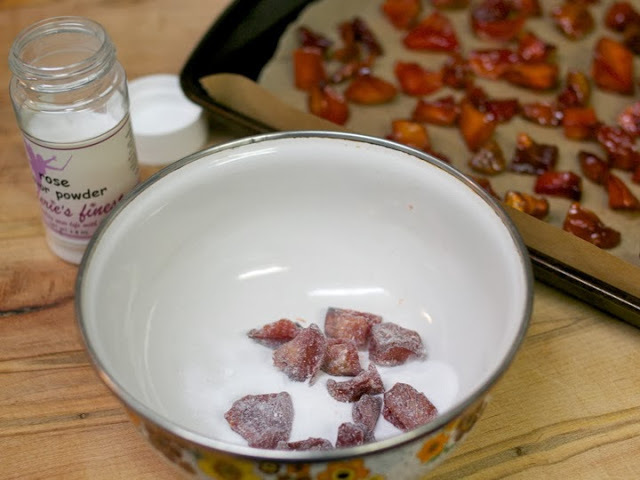 You can either toss the quince pieces in confectioners sugar and serve them as candies (the sugar will melt on the quince if stored for too long). You can serve them as they are or blend them into a paste (much like guava paste) to devour alongside a platter of cheese. Or, chop them into smaller pieces and to bake with them or top granola! To lighten the sticky mess and dishes, I like to use a Silpat , a non-stick silicone baking mat. Parchment paper works too!